On Friday, FIFA announced India as the hosts for the FIFA U-17 Women’s World Cup in 2020, which will be the first time the nation will host and take part at the tournament in its history. It will also be the second FIFA World Cup event being held in India in four years – the first being the FIFA U-17 World Cup in 2017. 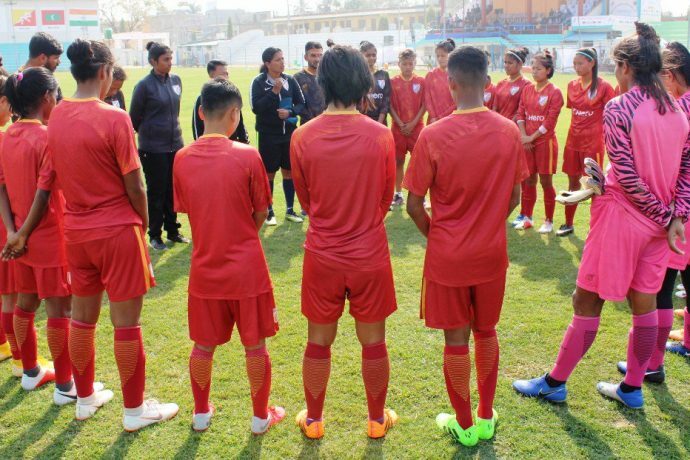 The development, which was hailed as a “proud moment” by AIFF President Mr. Praful Patel, sparked immense joy in the senior women’s team as well, who are currently in Nepal for the SAFF Women’s Championships 2019. “My initial reaction was ‘Wow!’,” said head coach Maymol Rocky, before stating that hosting the World Cup will be a huge step in developing the sport and increasing its popularity, especially among girls. Coach Maymol also said that like the FIFA U-17 World Cup in 2017, this competition will pave the way for the sport to grow pan-India. “The U-17 World Cup in 2017 was a huge success and this is a chance to carry forward the excellent work,” she declared. Goalkeeper Aditi Chauhan hailed the news as a “gamechanger” for the sport in India, stating that it will be a “great platform” for future players. “I’m very excited that India will host the FIFA U-17 Women’s World Cup next,” she said. “It will be a golden opportunity for the girls to step up and change the way women’s football is looked at in our country. We are already moving in a positive direction and this World Cup will accelerate the process and can be a real gamechanger for us,” the custodian added.